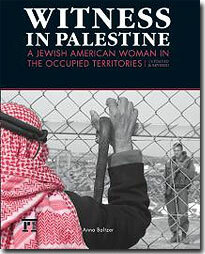 Composed of Anna’s photographs and writings, Witness in Palestine documents her eight months working with the International Women’s Peace Service in the West Bank, documenting human rights abuses and supporting Palestinian and Israeli nonviolent resistance against the Occupation. Meet Munira, who has lost her freedom and land to the Wall that encages her home and family. Meet Hessa, whose village is separated from the nearest hospital by a checkpoint that is closed all night long. Meet Rafat, whose warm smile belies the war zone that his body attests to. Meet Omar, who has chosen the path of nonviolent resistance after six months imprisonment without charge and the losses of his best friend, cousin, and brother. Meet the people of Palestine and the Israeli and international volunteers supporting their nonviolent movement for freedom.